Yusuf Al-Qaradawi is a political opponent and has been a Qatari citizen since the 1970s therefore Qatar will not extradite him, Qatari foreign minister, Mohammed Bin Abdulrahman Al Thani indicated Thursday. 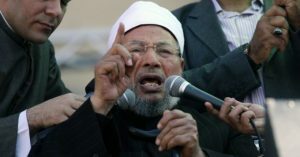 Al-Qaradawi, a born Egyptian national, is wanted by Cairo over his bonds with “outlawed” Muslim Brotherhood party. After the coup on President Morsi, Abdelfettah al-Sisi has vowed to crackdown the organization which he claimed is more dangerous than the Islamic State group. Like Egypt, the Arab League in 2014 blacklisted the organization as terrorist group. The North African country and its Gulf allies namely Saudi Arabia, United Arab Emirates (UAE) and Bahrain have since June 4 severed ties with Qatar that they accuse of supporting terrorism and harboring members of the group. Qatar categorically denied the charges. Mohammed Bin Abdulrahman Al Thani argued that classification of the group by other countries as terrorist group does not correspond to International criteria. The Qatari official also noted that the tiny Gulf country is a safe-haven for political opponents like Al-Qaradawi and not for Muslim Brotherhood. Written by: Jaber Ali on September 29, 2017. Posted by Jaber Ali on Sep 29 2017. Filed under Headlines, World News. You can follow any responses to this entry through the RSS 2.0. Both comments and pings are currently closed.